15th November 2016 - This article may contain affiliate links where I receive a small commission for purchases made at no extra cost to you. I’ve always been a little afraid of hitchhiking. Perhaps it was a childhood raised on horror films; nowhere else is it so strongly affirmed that the only people who stop to pick up hitchhikers are murderers and psychopaths. 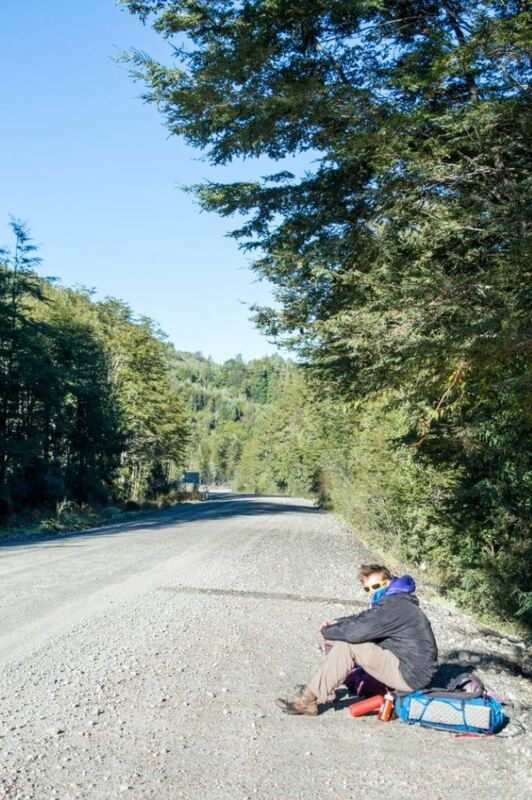 Hitchhiking in Chile seemed like a recipe for disaster. 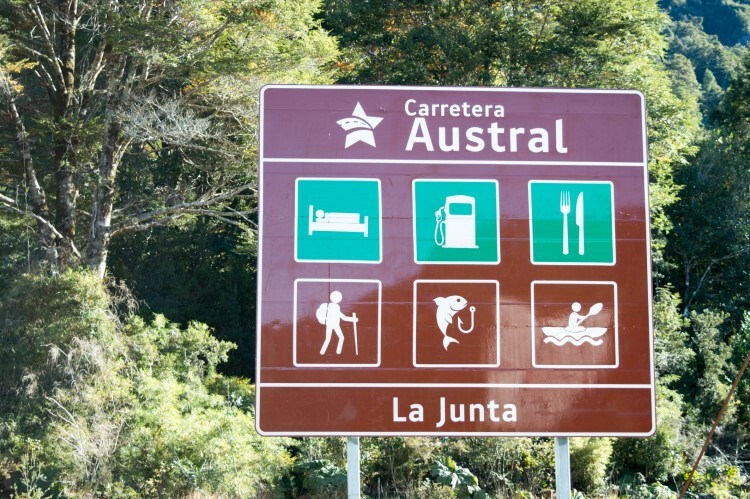 But there I was, thumb out to the Carretera Austral, my rucksack on my back, and buoyed by the fact that people in Patagonia don’t murder people, right? Peter, my new hitchhiking companion, had promised me this was the case. He’d been doing it for the past two years and he wasn’t dead yet. Our chances seemed pretty strong. Within five minutes, one of the characteristic red 4x4s (more common than active volcanoes in this part of the world) had pulled up. The passenger side window wound down and the smiling faces of two local men appeared. “¿A dónde vas?” Where are you going? The driver asked, cheerfully. “Al cruce a Puyuhuapi.” To the crossroads for Puyuhuapi. “Si, sube.” Yeh, jump in. And we did, launching our rucksacks into the open boot before sliding awkwardly into the back seats. As we pulled off, Michael and Hernan introduced themselves with a brief nod, and a round of questions about what we were doing in Patagonia. Two friends who worked at the nearby docks in Puerto Chacabuco, they were more than happy to give us a lift as far as they could. Thirty minutes and a short complimentary photo stop at a lookout over the smoggy hulk of the area’s largest town, Coyhaique, and we were being dropped off. Here, the road continued on towards Puerto Aysén, but we were hoping to head another couple of hours further north to Parque Queulat, near the fjord-side village of Puyuhuapi. They wished us good luck for our next hitch and warned that we shouldn’t try much longer to get a ride. It would fall dark soon, and further towards Puyuhuapi, we would find ourselves in the mountains where temperatures could get dangerously cold at night. Peter was equipped with more camping gear than a Boy Scout leader, but still – I wasn’t keen on finding out the lowest temperature that my sleeping bag would operate at, nor how many toes would be lost in the experiment. But, as I’ve learned during my two year travels in South America, there is something known as travel serendipity. When you’re in the greatest need for good luck, it will find you. I’d experienced it once before in the lowlands of Bolivia, when I’d found myself stranded miles from civilization with only a few biscuits and a bottle of water to see me through a very lonely night. Luckily, my desperate prayers had been answered. I’d been picked up by a pair of truck drivers, confused as to what a lone “gringa” would be doing on such an isolated stretch of road – let alone attempting to hitchhike in Bolivia – and more than happy to take me onwards to the next town. As it turned out, travel serendipity was alive and well in Patagonia, too. As if planned directly by the travel gods, another red jeep pulled up alongside us. “¿Sabes cómo llegas a Puyuhuapi?” Do you know how to get to Puyuhuapi? Nodding with enthusiasm – and confident my GPS would help – we leapt in, both amused and thankful for the sheer fortunate coincidence of that moment. Without much chance to showcase our Spanish, our new drivers – an older couple called Isabel and Martin – were soon chatting away in English. It turned out they’d seen most of the world, having lived in both London and the US where Martin had worked as an anesthetist, and they’d travelled to places as far flung as Russia. Now living in Santiago, this was also their first adventure on Chile’s most beautiful road. The stories of their trips kept us entertained for the three-hour drive, and as we finally left them on the outskirts of Puyuhuapi, Isabel stuffed a handful of toffees into a bag, positive that we’d be wanting them over the next few days of walking. I had the suspicion that we were roughly the same age as their children – two of whom were now living on foreign shores – and that we were receiving the motherly attentions that she clearly hoped her own would be getting from another kind stranger, somewhere. Over the next few days, we encountered an endless supply of friendly locals, all happy to stop for a lone traveller or two, and often going out of their way to make sure we arrived at our destination. Hitchhiking is a normal part of the culture here, and one used regularly by young Chileans. Many hitch the south of the country, both for a cheap holiday and an unrivalled perspective on some of the most beautiful parts of Patagonia. 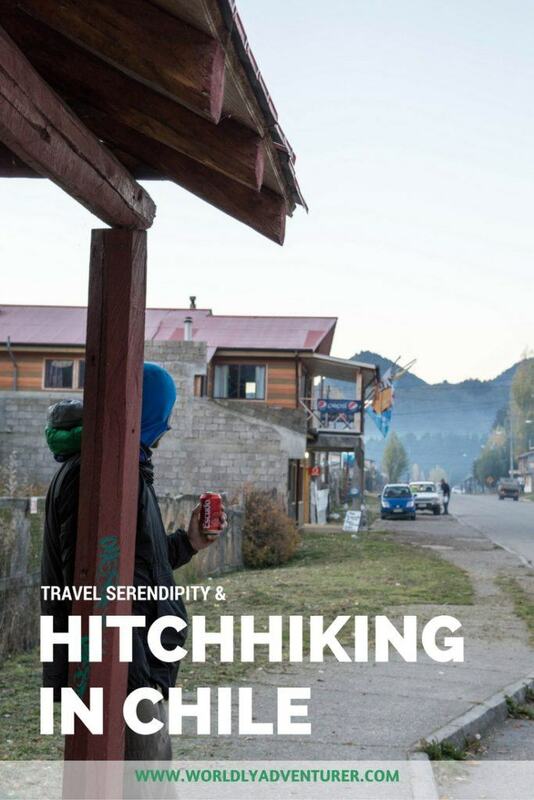 Hitchhiking is a normal part of the culture here, and one used regularly by young Chileans. Many hitch the south of the country, both for a cheap holiday and an unrivalled perspective on some of the most beautiful parts of Patagonia. For foreigners, it’s an unusual way of travelling. I once met a Polish girl in La Paz, Bolivia, who’d hitchhiked all the way down from Colombia. I was impressed; I certainly didn’t have the balls to hitch alone, and I’d heard that hitchhiking in South America wasn’t a great idea in most countries, where safety was an issue and hitchhiking wasn’t common amongst the locals. I’d asked her about whether she’d ever felt unsafe, and was less than reassured by her explanation that she always made sure to have a long conversation with the driver so that they would see her as a real person – rather than just a vulnerable, lone girl. From that moment onwards, hitchhiking had seemed less of an attractive option. And admittedly, not all of the drivers that we met that weekend were ideal. One of the workmen who picked us up only took a few minutes to leave us regretting our choice to get into his car. Jokingly, he’d told me that neither his lights nor his brakes were working. I laughed, assuming that no one in their right mind would take other passengers if this was indeed the case. Sensing my disbelief, he’d proceeded to demonstrate how only a gentle, prolonged squeeze of the brakes had any effect; doing so served to produce a thin squeal as the barely-existent brake pads pressed valiantly, but ultimately ineffectually, against the wheel disc. If that wasn’t enough, a short while later he’d taken a hunting knife out of the glove compartment to make a sandwich, barely keeping the car from weaving off the side of the road as he’d gripped the wheel between his knees. Surprisingly astute to my discomfort, he’d eventually dropped us at the next village, waving as he drove away. But, despite this, hitchhiking in Chile restored my faith. The vast majority of drivers who we met were kind and genuinely interested in our journey, as we were in theirs. My favourite was Paulo, a lorry driver. His passenger door clearly stated that he was, under no circumstances, allowed to accept passengers; but he gladly welcomed us on board. Originally from a small town further along the Carretera, he spent eight hours a day traversing the length of Chile, carrying a cargo of valuable minerals to the docks at Puerto Chacabuco. He was very proud of his work, noting the series of qualifications he’d had to acquire and the many years he’d spent driving the roads in order to be able to transport such an expensive cargo. But he admitted to be lonely at times, and said that his favourite way to pass the journey was to pick up hitchhikers, as they gave him someone to talk to. He was very proud of his work, noting the series of qualifications he’d had to acquire and the many years he’d spent driving the roads in order to be able to transport such an expensive cargo. But he admitted to being lonely at times, and said that his favourite way to pass the journey was to pick up hitchhikers, as they gave him someone to talk to. But he admitted to being lonely at times, and said that his favourite way to pass the journey was to pick up hitchhikers, as they gave him someone to talk to. When we first set out to travel along that stretch of the Carretera Austral, we were planning on trekking through the sublime Chilean landscape. We walked to the surreal hanging glacier in Parque Queulat and passed an afternoon, spellbound, as we trekked through the nearby Enchanted Forest and glacial lake beyond. But the real highlights of that trip were the chances it offered to hitchhike in Chile and to meet a whole range of new people. Those conversations and momentary interactions with the Chileans who offered us lifts; the people were told us their stories and showed how welcome we were in their country – these are what have stayed with me more tangibly. 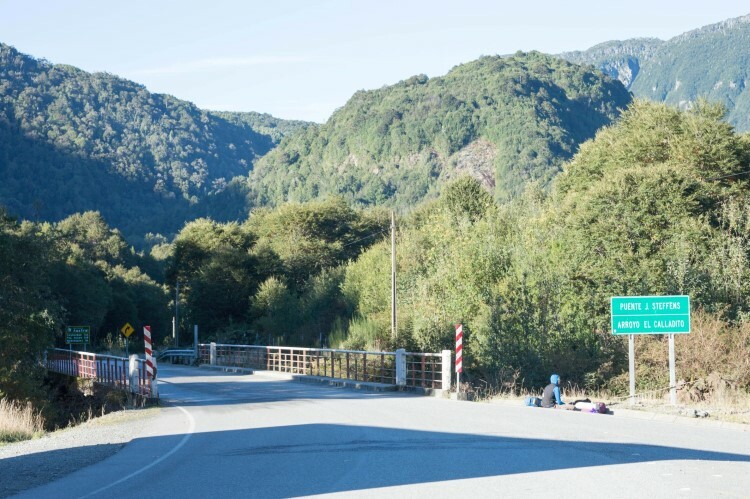 Never once – save during the ride with our sandwich maker – did I feel unsafe hitchhiking in Chile along the Carretera Austral. More often than not, I was surprised by their genuine concern for our safety, and their desire to make sure that we arrived at our destination. It was a liberating way of meeting a whole range of different people, and completely unlike any way I’ve travelled previously. Although hitchhiking in Chile may seem dangerous or out of character for travellers, putting your trust in humanity, and sticking your thumb out for your first hitch, will quite possibly lead to some of the most memorable experiences of your travels. Have you hitchhiked in Chile or anywhere else in South America? I’d love to hear about your experiences in the comments below. Want to hitchhike but not sure how to get started? Read my top tips for getting a safe hitch in South America. Read about others’ experiences of hitchhiking in Chile and South America and how safe they felt doing so. Share the love: pin me! Is It Ever Safe to Hitchhike in South America? Next Post: What’s It Really Like Travelling Alone in Bolivia? I imagine in Coyhaique you will find it (if obscenely expensive, but everything is in Patagonia!). Other than that, I would be surprised if you can find it. If you’re coming from the south, El Calafate in Argentina or Punta Arenas further south in Chile are your best bets too as they’re the largest towns in the area. Good luck!